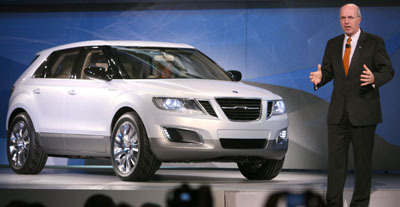 Introduced at the 2008 Detroit Auto Show, the Saab 9-4X BioPower Concept is a compact crossover SUV that takes several styling cues from Saab's 9-3 sedan lineup. 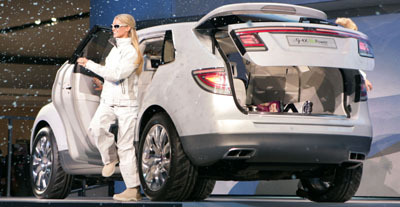 The SUV, however, doesn't share any of its basic underskin design with the 9-3 or any other General Motors vehicle. The 9-4X's other "hook" is its engine. Though its 2.0-liter turbocharged four-cylinder engine is similar to what Saab offers in 9-3, "BioPower" is what separates it. The engine is designed to offer optimum performance while running on the E85 ethanol/gasoline mix, rather than conventional gasoline. Taking advantage of E85's higher octane rating allows the engine to produce 300 horsepower and 295 pound-feet of torque on the corn juice. On refined crude oil, output drops to 245 horsepower and 261 pound-feet of torque. A six-speed automatic transmission with steering-wheel paddles is standard, as is Saab's new XWD "cross wheel drive" all-wheel drive system. Saab says the 9-4X can run from 0-60 mph in 7.9 seconds. The BioPower engine is currently available on cars that Saab sells in its Swedish home market. Whether the technology will make it to the production version of 9-4X and other Saabs sold in North America remains to be seen. Also recently introduced in concept guise was Cadillac's Provoq crossover. A production vehicle based on Provoq is rumored to share much of its basic architecture with the 9-4X. Like the BioPower, Provoq also boasts a "green" drivetrain, in this case a plug-in hybrid system. As it's still a "concept", 9-4X pricing and availability weren't announced at the show. Count on the 9-4X getting the green light for production soon, though, as buyer interest in the premium compact SUV segment increases. It should be priced in the heart of the segment, which means somewhere in the neighborhood of $35,000.